ACTOR George Irving freely admits that he has the type of face that gets him regularly pulled over by customs officers and he has lots of offers to play TV baddies. But his fans will recognise him from his four year stint as an aloof hospital consultant in hit TV series Holby City. 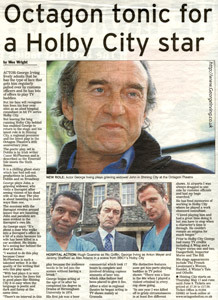 But leaving the long running Holby City behind has enabled George to return to the stage and his latest role is in Shining City, a regional premiere and the latest play in the Octagon Theatre’s 40th anniversary year. The poetic play, set in Dublin is by Irish writer Conor McPherson and is described as the Emerald Isle meets the Sixth Sense. It is a chilling ghost story which has had sell-out productions in London, Dublin and on Broadway. George plays John, a grieving widower, who visits a therapist after seeing visions of his dead wife at his door. The play is about haunting in more ways than one. The sessions with the therapist revolve around issues that are haunting John and parallels are soon evident in the therapist’s own life. As George says: “It’s about a man who walks into a therapist’s office in a bit of a state because his wife has been killed in a car accident. He thinks he’s seeing her behind the door at home. “I wanted to do this play because Conor McPherson is such a talented writer. It is the quality of the writing that sets this play apart. “With bad plays it is very hard to learn the lines but in good plays like Shining City it is easy when the language is poetic and dark and funny at the same time. George began acting at the age of 24 after he completed his degree in Drama at Birmingham University in 1974. His first job was a beer commercial which took 17 hours to complete and involved drinking copious amounts of beer into which Alka-Seltzer had been placed to give it fizz. After a stint in regional theatre he began acting in TV shows mainly at Granada. He has fond memories of working in Holby City where he played a work obsessed consultant. Prior to Holby City George had many TV credits including A Wing and a Prayer series one and two, Dangerfield, Inspector Morse and The Bill. His stage appearances include The French Lieutenant’s Woman, Hamlet, A Winter’s Tale and Othello.